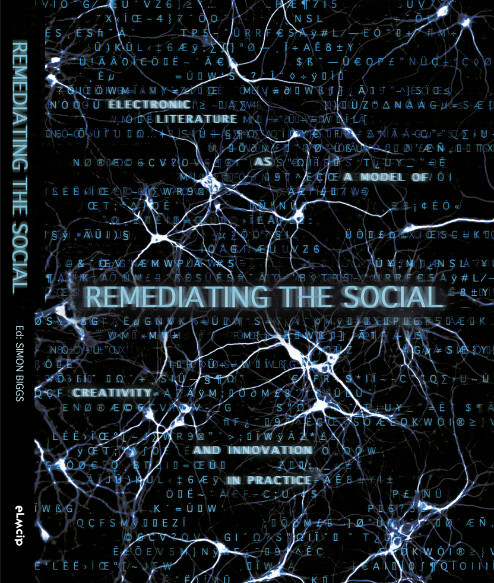 “The first international anthology to document a radically new poetry which takes language beyond the confines of the printed page into a non-linear world of digital interactivity and hyperlinkage. 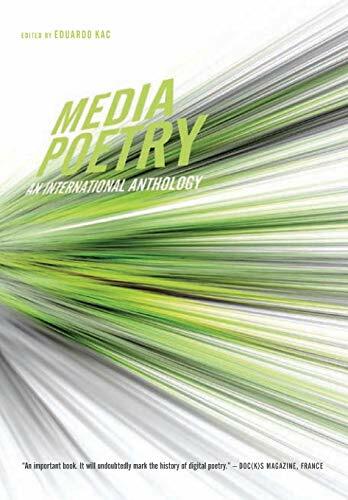 The work of the poets discussed in this book challenges even the innovations of experimental poetics. It embraces new technologies to explore a new syntax made of linear and non-linear animation, hyperlinkage, interactivity, real-time text generation, spatiotemporal discontinuities, self-similarity, synthetic spaces, immateriality, diagrammatic relations, visual tempo, multiple simultaneities, and many other innovative procedures. Since the construction of the first computer in 1948, text is not only written and read, but also executed. Authors are now able to compose documents that produce content when run. 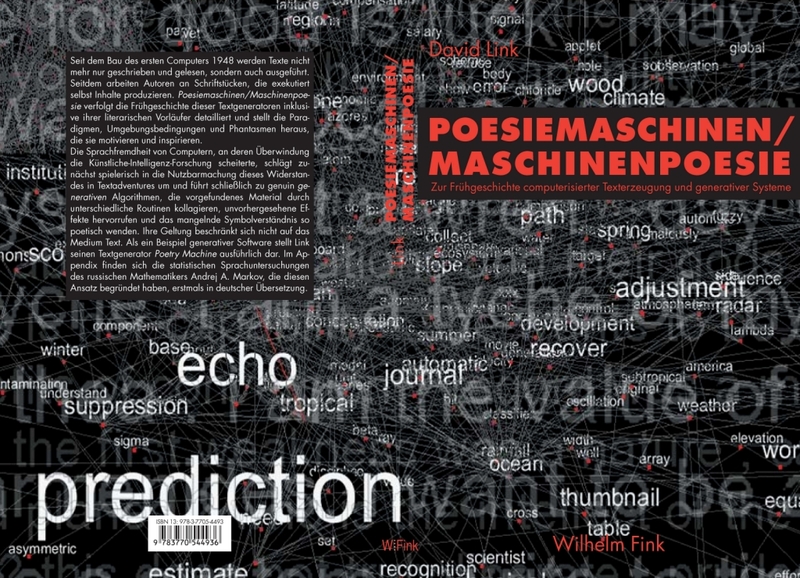 “Poetry Machines / Machine Poetry” investigates the early history of these algorithmic artefacts in detail, traces them back to their literary predecessors, and emphasises the paradigms, contexts and phantasms that motivated and inspired them. Computers are fundamentally alien to language. While Artificial Intelligence research in the 1960s and 1970s tried to overcome this difficulty unsuccessfully, text adventures used the same resistance playfully to enhance the suspense of the game. The book analyses variable scripts, Joseph Weizenbaum’s “Eliza”, Kenneth Colby’s “Parry”, early adventure games and Terry Winograd’s “SHRDLU” down to their source code, points out their metaphorical and logical structures, and places them in a genealogy of growing algorithmic complexity. The attempts are based on the belief that language and the knowledge about the world represented by it can be fully explained and even be formalised, emphatically advocated for instance in Ludwig Wittgenstein’s “Tractatus Logico-Philosophicus”. Technically, optional elements are arranged in tree-like structures and generate seemingly endless variance. An antagonistic tradition of thought connects the dadaist Tristan Tzara, Claude E. Shannon’s re-discovery of the Russian mathematician Andrey A. Markov and the “Cut-Up” experiments of William S. Burroughs. It focuses on operations rather than on options and develops genuinely generative algorithms, which employ different routines to turn found material into collages and to produce effects unforeseen. The lacking machinic understanding of symbols transforms into poetry. For principal reasons, the study of algorithms cannot proceed purely theoretically. As a concrete example of generative software, whose scope is by no means limited to the medium of text, Link gives an overview of a program he developed in the context of this research, “Poetry Machine”. The interactive text generator is based on semantic networks and acquires information about language autonomously from the internet. The translation of the fundamental text “An Example of Statistical Investigation of the Text ‘Eugene Onegin’ Concerning the Connection of Samples in Chains” by Andrey A. Markov, which can be regarded as the foundation of the generative approach, is given in the appendix.